A piece of performance art for the ages wrapped up early Saturday morning as the centerpiece of Michael Heizer’s Levitated Mass finally reached LACMA to fanfare typically reserved for a Hollywood premier. The star was a 340-ton rock that had enraptured spectators throughout its week-and-a-half journey into the city from a quarry near Riverside, CA. 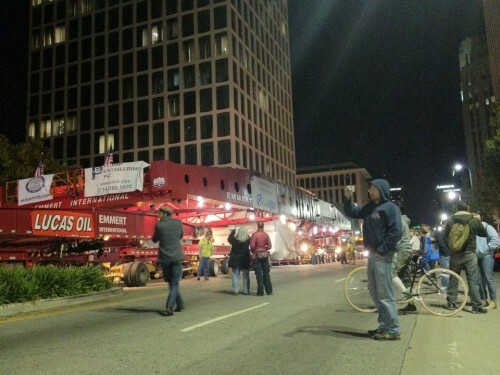 Hung from a 22-axle, football-field-long carrier, the rock was greeted by thousands of spectators in the streets of LA as it slowly crawled towards its final destination on the northwest corner of the LACMA campus. “We’re really pleased it got here in one piece,” said Miranda Carroll, LACMA’s director of communications, who clocked the boulder’s touchdown at the museum around 4:30 a.m on Saturday morning. Along the last leg of the trip people found viewing platforms in both typical and atypical places: atop the closed Interstate 10 onramps, huddling together amongst the green medians along Wilshire Boulevard, and crowding sidewalks and local businesses while mixing excitedly with the unsuspecting late-night bar scene. “The Rock” traveled through four counties and 22 cities, according to Carroll, moving through its 105-mile route only at night, at speeds of 6-8 mph, and resting along the roadside during the day. The final leg of the journey started at Florence and Figueroa Street, where the rock travelled from South Los Angeles, past Exhibition Park and the USC Campus, up Western Avenue, and west onto Wilshire Boulevard. As with previous parts of the trip, power lines had to be lifted, a few cars towed, and traffic lights moved by engineers so the rock could navigate down city streets. As part of LACMA director Michael Govan’s ambitious plan to develop free public art on the museum’s campus, the megalith will now be positioned atop a 456-foot concrete slot that has been waiting for it to arrive. 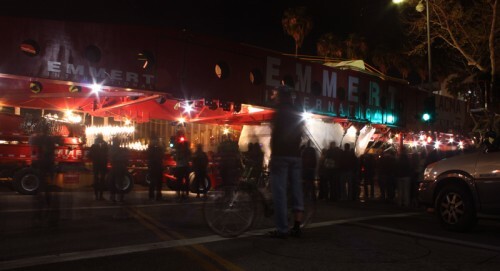 Levitated Mass is expected to be open to the public in early summer 2012.